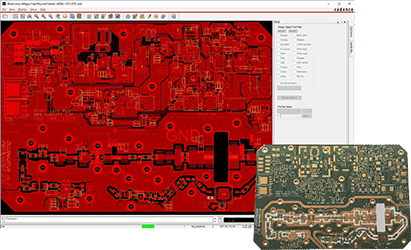 NuWaves has in-house printed circuit board (PCB) assembly and prototype fabrication capabilities, which utilize a computer controlled machine to route circuit traces and drill vias on the circuit board. Since it is fabricated from the standard Gerber files, the complete printed circuit board has exactly the same characteristics as a circuit board fabricated using conventional chemical etch process. Because the total process is in-house, complete prototype circuit boards can be built in short order. Moreover, NuWaves has automated parts placement equipment for very high production quantities, and skilled assemblers to complete the hand placement typically used for prototype circuit boards. All printed circuit board designs are developed using Allegro PCB and Schematic Entry software. The circuit Bill of Material (BOM) is generated directly from the schematic, ensuring accuracy of the components part numbers, values, etc. The Allegro layout tool also utilizes the schematic information from the schematic entry tool, thus assuring that the interconnects, component pin-outs and footprints are correct. In addition, NuWaves utilizes a 3D mechanical CAD tool for its smaller (size constrained) designs to ensure the mechanical design is optimized to fit within the smallest possible space. This tool imports the physical size and position of the circuit card components from the Allegro Layout tool. The mechanical suite has an available 3D thermal analysis plug-in which predicts heat flow and resulting temperatures as a function of the dissipated power of each of the components.